I boarded a train in Trieste. It ran along a high ridge overlooking the Adriatic Sea where a number of oil tankers were lined up. 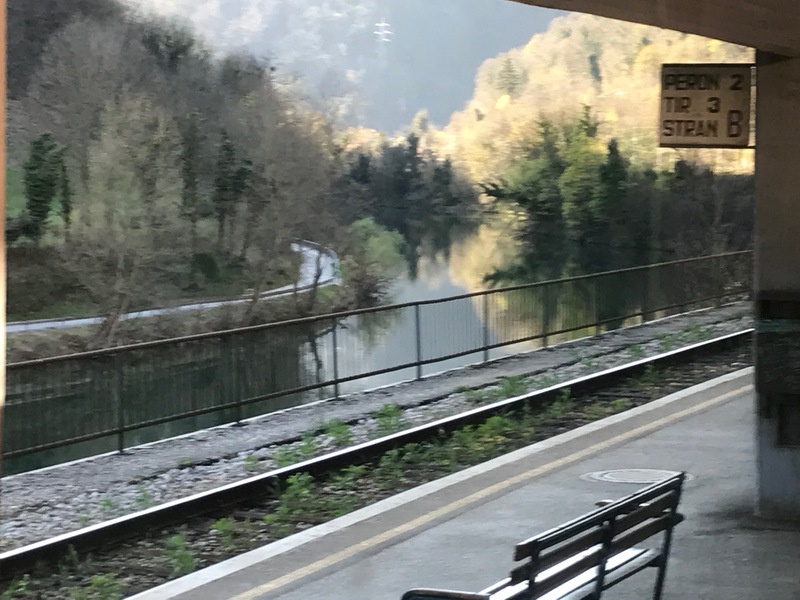 Soon the train left Italy and entered Slovenia, a country that was once part of Yugoslavia. 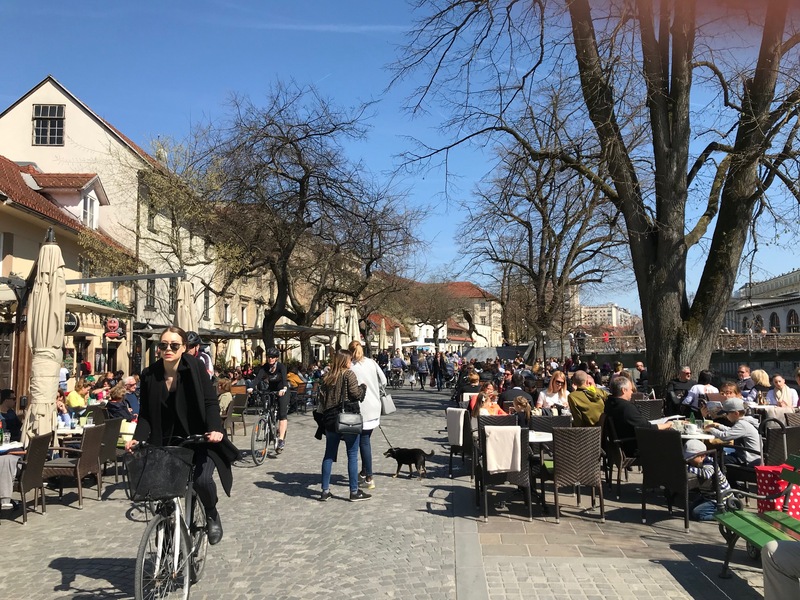 An independent country only since 1990, Slovenia gives an interesting view of both 20th and 21st century life in eastern Europe. The train passed farms and small towns comprised of American-style homes. Many were single family, quite large, and some had garages. The farms appeared to be old but successful, and at the end of March they were still showing their winter doldrums. There was a good new highway running alongside the train tracks most of the way across the country. One town the train stopped in was named Logatek. Doesn’t that sound like it should be in the Silicon Valley? 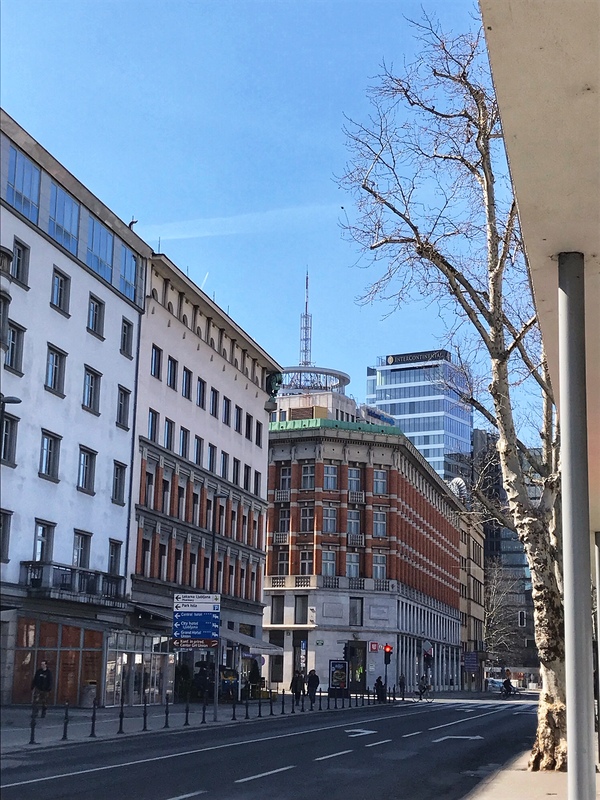 This is a view of Ljubljana snapped as I walked out of the station. After a couple of hours the train entered Ljubljana. Because Slovenia is an EU country the border between it and Italy was open and the train I rode was from TrenItalia. 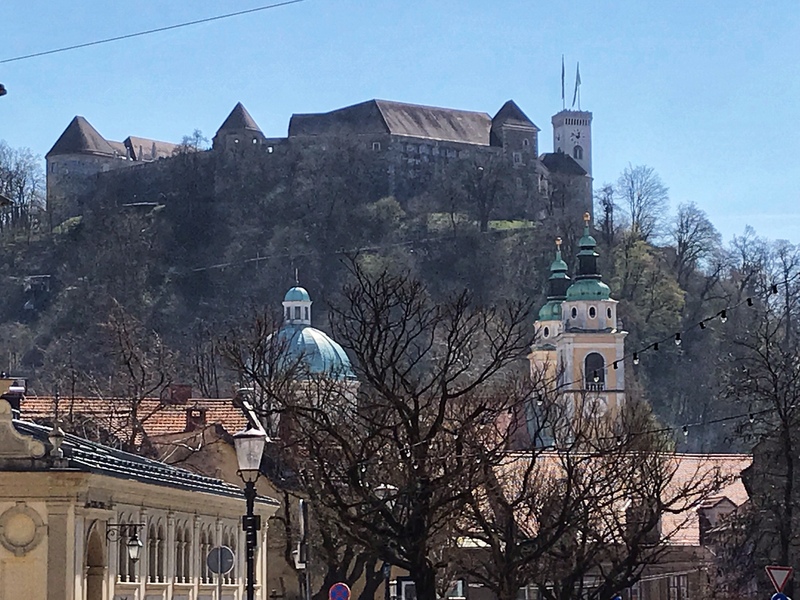 I didn’t have much time for sightseeing but luckily the station is near the old town and soon I spotted the castle on the hill and the old yellow domed church beneath it. The train running from Slovenia to Croatia was an old style with six-seat compartments. At one point a man nearby could be heard singing opera as he tried to woo someone. He had a good voice but she didn’t seem to be impressed. Just a few blocks from the train station I discovered this scene: castle on the hill and eastern style church steeples. The ride from Ljubljana to the border with Croatia ran below the snow-covered Alps and followed the river Sava. The river began as a shallow body of water running over baseball-sized stones. Toward the east the river raced through rapids, over boulders, reminding me of West Virginia, surrounded by mountains all, filling it as it ran in a southeasterly direction to Zagreb and beyond. Then it became very full and smooth until it reached the dam. There someone hang gliding from a mountain hung high in the air over the full river. On a beautiful Saturday afternoon the terrace along a canal was busy with people enjoying lunch. When the train reached the border between Slovenia and Croatia it stopped and Croatian customs agents boarded. They required ID from each of us. At my request they stamped a visa into my passport. Both of those countries are members of the European Union now but Croatia is not yet a signatory of the Schengen Treaty, the agreement that enables open borders within the E.U. The Schengen rules have been a problem for me as I plan this long journey. I’ll write about that soon. 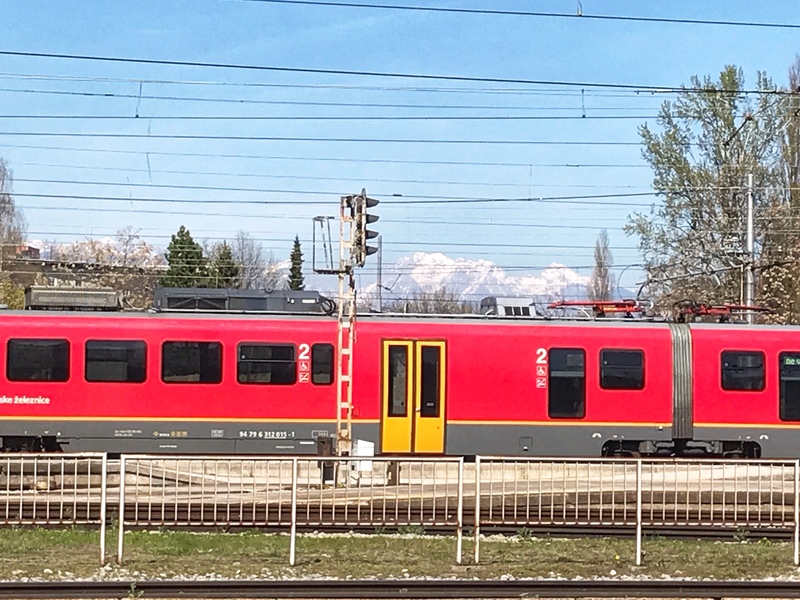 I took this picture to capture the vivid red train but it turned out to be my only photo of the snow-covered Alps in Slovenia. This entry was posted in Slovenia by Libbie Griffin. Bookmark the permalink.